I love road trips. Getting up before dawn, driving through empty streets and out on to the highway before the madding crowds are awake always holds a childlike anticipation and excitement. There�s the first stop at the service station which brings with it heart attack garage coffee and packets of random sweets you�d usually never dream of eating. Then someone sneaks a ludicrous 80s CD on to the stereo� and WHAM, there�s that holiday feeling! Two girl friends and I headed for the Cornish south coast in a serious quest to locate the perfect resting spot. Oh, and the perfect eating spot, but then that�s always a given where we are concerned (see below). 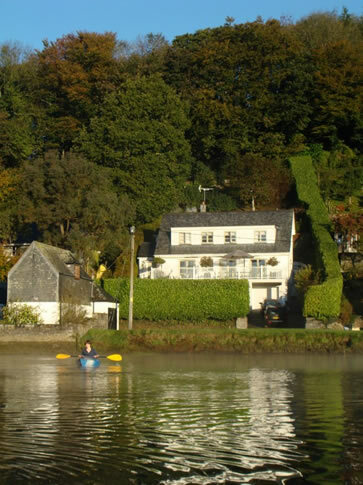 Our destination was a tiny village called Lerryn and a rather grown-up holiday home called Waters Reach on the banks of the Lerryn River. 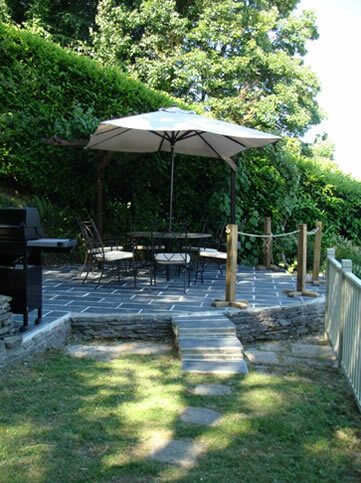 If you know Cornwall, the nearest town is Lostwithiel and then there�s Fowey and Looe close-by on the coast. For those who don�t, this appears to be the less hectic side of Cornwall. Towns are small and villages picturesque, cliffs high and windswept, beaches rough and wild. I also noticed that, mercifully, stags and hens are rare breeds in these parts. At first sight, Waters Reach is a handsome, white, clapboard house with a neat front garden and an expansive deck with scenic views over the river to distant rolling pastureland. It�s only when you wander to the back of the property that you realise the enormity of its gardens stretching far up the hillside in wide terraces filled with wildflowers, trees and lovingly nurtured flowerbeds. Someone�s a gardener! On two levels there are sunny paved areas for sitting and enjoying the merry chirping of songbirds in the hedges or, in our case, lots of sundowning. Luckily we picked about the hottest weekend of the year and when we weren�t out exploring, spent most of our time lolling on the deck or in the garden eating, reading and congratulating ourselves. We didn�t get around to the outside gas BBQ, but we most certainly will next time. The house inside affords every conceivable comfort including one of those huge, well-equipped kitchens with an Aga and a kitchen table where everyone would naturally congregate should the weather turn nasty. Waiting for us was a generous hamper of goodies including Cornish butter, clotted cream, local red wine, ale chutney, Cornish brie and oat biscuits ... a truly mouth-watering welcome for hungry travellers. The bedrooms are big and light and all have large windows to throw open to the views of the scented garden, outside terrace and river. The house sleeps eight comfortably in four bedrooms; two rooms with super-kings (zip-linked, so can be separated) and two more with two single beds in each. 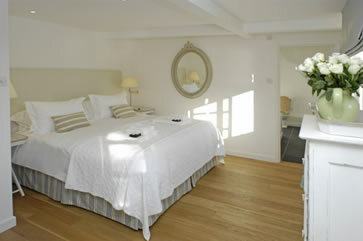 One of the rooms has bright kiddie appeal with a ninth smaller bed for a child, and leads out on to its own beautiful back patio and path up to the garden. You�ll sleep the sleep of the dead in these beds� once lost in the depths of fluffy pillows and duvets adorned with White Company linen, sleeping late and afternoon nap time can get completely out of control. A spacious lounge adjoins the kitchen, both with doors opening wide on to the front deck. There�s also a smaller parlour at the back which is perfect for kids as they can closet themselves away to watch TV or play games, as well as having their own table and chairs where they can eat. The village sprawls across both riverbanks and hillsides. After dark it is so quiet you can actually hear a conversation in perfect clarity on the other side. It must make for interesting �Cornish whispers� but for city tourists, the peace is a welcome luxury. Heading out for the day, there�s so much in the area to do. We spent time exploring the little towns of Polperro and Polruan and scanning the coast for the best beaches from Fowey up to Looe. We walked windy pathways, explored rocky caves and sprinted through rising tides. At one point we had a massive beach all to ourselves to wander and frolic in the waves... and then the promise of a blissfully hot bath in a clawed tub and a glass of bubbling champagne waiting back at the house. Style Stylish, spacious riverside residence. 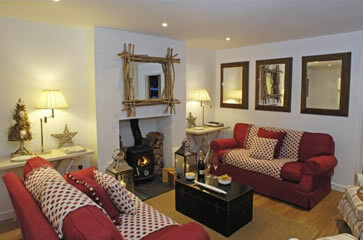 Setting On the banks of a tidal river, situated within a terraced garden. Why you'll love it The peace and quiet and the bucolic views. Its heavenly English country garden. The house itself has everything that opens and shuts� there is even baking equipment! Good to know There is no mobile phone reception in the village and you have to walk or drive out of the valley to receive any. But there is a home phone and internet with broadband should you wish to be in touch with the outside world. There are some fabulous restaurants in the area so research online beforehand and book before you go. Also see �Cornish Cuisine�. Wow factor The garden and the huge front deck. Summer evenings outside on one of the terraces with friends and family, a chilled sundowner and delicious BBQ smells wafting through the air. The two main bedrooms have enormous super-king-size beds � absolutely up there in the top 10 most comfortable sleeps of my life. Room for improvement If you�re attached to your mobile phone you may have problems. The table in the kitchen, although big and spacious, is a nightmare to fit adult legs under but is perfect for kids. 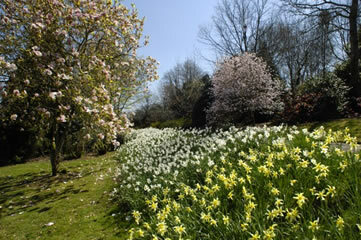 With the terraced garden and the river so close to the front of the house, younger children will need to be supervised. Rates Prices fluctuate depending on the date of booking. Summer holidays book up very quickly. Normal rates for summer (from 3rd June) start from �830 for up to 4 people over the weekend - Fri to Mon (3 nights) and �1,205 for up to 9 people. A weekly stay in high summer (7 nights) starts from �2,765 for up to 9 people. Travel ServicesTaxis can be pre-arranged to pick up from the station and car hire can be arranged. Hi, I am travelling to Cornwall next month. Is Waters Reach available in the last week? I�m tired of the food in London. A lot of the time I feel underwhelmed and ripped off. Calling it something French or attempting to dazzle me with foam de celebrity chef is just simply not cutting the mustard. It�s a good thing I went to Cornwall when I did because I found delicious, simple food and I think London could take a herb out of its cookbook. So you may well ask, what�s the answer? Simple: its FRESH LOCALLY-SOURCED PRODUCE. Remember those halcyon days when a tomato tasted like a tomato � earthy, sweet, tangy, warm? Then think about the last time you had a fillet of fish that wasn�t borderline anorexic. Now, if you dare, conjure up the aroma of bread made a few minutes ago, oozy cheese from a farm down the road, and the aunty next door who still makes chutney from an ancient family recipe� are you salivating yet? 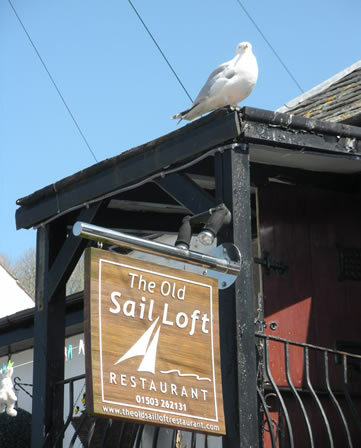 Three critics, all serious foodies, tried two restaurants: The Old Sail Loft in Looe for lunch (www.theoldsailloftrestaurant.com), quite by accident, and Trewithen in Lostwithiel for dinner, which we had booked in advance (www.trewithenrestaurant.com). We were VERY glad we stumbled upon our lunchtime spot as we were famished after our long drive and fancied something filling and tasty. 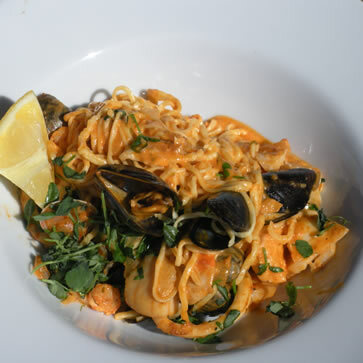 Ogling mouth-watering dishes being whisked past to other patrons, we decided the seafood pasta looked too good not to order. So we had three. It was made entirely from scratch with a generous scoop of plump, rich tomatoey seafood. We agreed it was one of the best we�d ever tasted. Outside in the sunshine, watched beadily by gulls, we savoured our meal slowly with a crisp Sancerre. Angels sang.